The Watershed Health Assessment Framework uses scores to compare the health of ecological systems across Minnesota. The Watershed Health Report Cards deliver a summary of these health scores for each of the 81 Major Watersheds in the state. The Watershed Health Report Cards are designed as a companion document for exploring watershed health with the WHAF interactive map. It is important to view scores together with other data and across spatial scales to more fully explore health patterns. To download the report card scores as GIS data, the Watershed Health Assessment Scores are available from the Minnesota Geospatial Commons. A health score is a comparative index that synthesizes statewide ecological data into a single range of values. 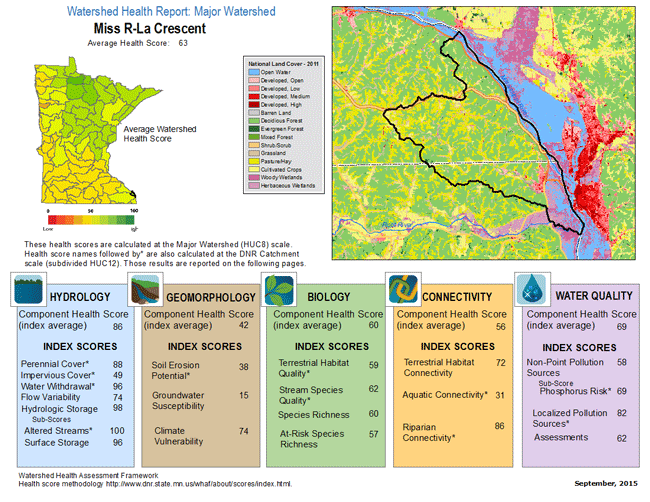 Health scores are calculated for all watersheds in Minnesota creating index values from 0 -100, red to green. A score of 100 indicates the best condition or least amount of risk; a score of 0 indicates an unhealthy condition or the highest health risk. The data used for calculating the score must be available for the entire state with data collection likely to continue into the future. Comparing health scores can reveal parts of the ecological system that are functioning well and those that may be facing challenges. The Major Watershed scores are reported on a single page summarizing health scores calculated at the major watershed scale. The average component health score and the underlying index scores are listed together under the five ecological component headings. Comparing health scores across all 5 components can reveal possible ecological strengths and challenges to investigate further. 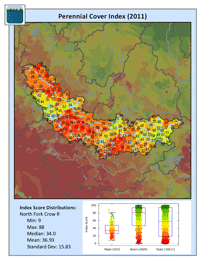 The combined overall health score at the major watershed scale is used as the locator map in the upper left. This combined health score provides a generalized pattern of ecological health across Minnesota. 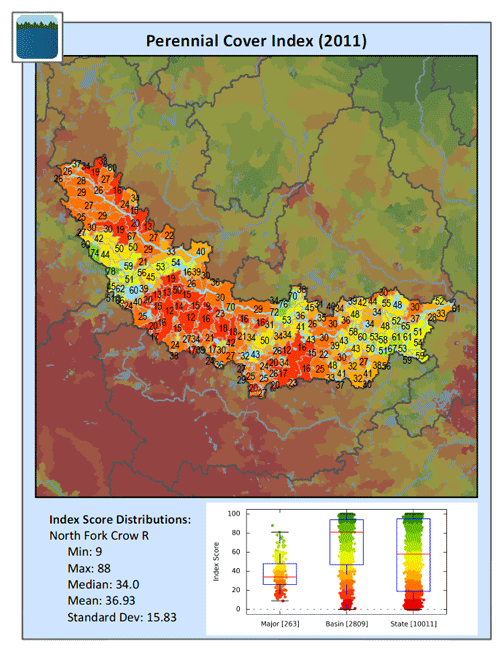 The next section delivers health scores for all DNR catchments within the selected major watershed. In cases where there is no data for an individual catchment, no health score is generated and the map will not show a value. This example shows the Perennial Cover scores for the North Fork Crow River Watershed. A ‘box and whisker’ plot is included to compare the numerical distribution of catchment scores. This plot compares the distribution of catchment health scores within the major watershed, within the same major river basin, and for all values in Minnesota. Scale is on the x-axis with the number of catchments in parentheses. How are health scores organized? The health scores are organized into five ecological components. Under each component, a suite of scores have been calculated to reflect different important ecological relationships. 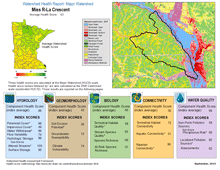 The health scores are calculated at two different spatial scales:the Major Watershed ((HUC8) and the DNR Catchment (subdivided HUC12)There are 81 Major Watersheds in Minnesota and more than 10,000 DNR Catchments sub-watersheds. Not all scores are available at both scales, data resolution and analysis approach influence the scale at which each score is delivered. More information is available about downscaling health scores.